Author’s Note: I really, really hate the look of the stage pictured, but I wanted a very ‘average’ looking stage. I’m going to fully admit that this post is pure opinion. Someone somewhere probably has an equally valid opinion that is the complete opposite of mine. But it’s my blog so I’m gonna say it: Generally speaking churches (and parents) should ban kids from the stage. Ban the kids from the stage? Didn’t Jesus say “suffer the children and forbid them not?” (Matthew 19:14). Yes, yes he did, and I believe ever word. But I do not believe that Jesus meant that we should let our children run wild and turn the stage, filled with band instruments, music stands and microphones into a scene from the Lord of the Flies. Suffering the children is not a prohibition against teaching our children to walk in obedience and to respect the property of others. I’m not a young single guy, or a grumpy old man who’s kids are long out of the house. My son is 16 months old with another little boy on the way. I’m in little kid headquarters. So I know first hand that my wonderfully curious son wants nothing more than to get into everything and every place that he shouldn’t. In my own house there are places that I do not allow him to go. Some of them we block off and some we have trained him that there are consequences if he goes there. Why would I do any less at church? One of the reason that I don’t let my son go certain places in my house is that it’s dangerous. I don’t want him going through the trash were there may be harmful bacteria waiting. I don’t want him going near stairs where he may fall and hurt himself. I don’t want him touching electrical things, ever, for very obvious reasons. The average church stages has plenty of things that a child could pull down on top of themselves or other children. The stage is full of trip and choke hazards. Electricity is in fully use all over the place, and wooden stools are surprisingly common hazards. While we all do our best to minimize these hazards, just like the garbage can at home, there are things that just have to be there. I want the kids off the stage for their own safety as much as anything else. I want to teach my son to obey. God, his parents, teachers, etc. I want him to be safe. But I also want to teach him to honor others. People who serve us on the worship team have invested a lot of time and money in their gear. That bass player would rather not have my son slam his fist on the bass. The keyboardist would rather not have my son push his keyboard off the stand (those X stands aren’t kids safe). It’s not just individual players I want my son to honor. 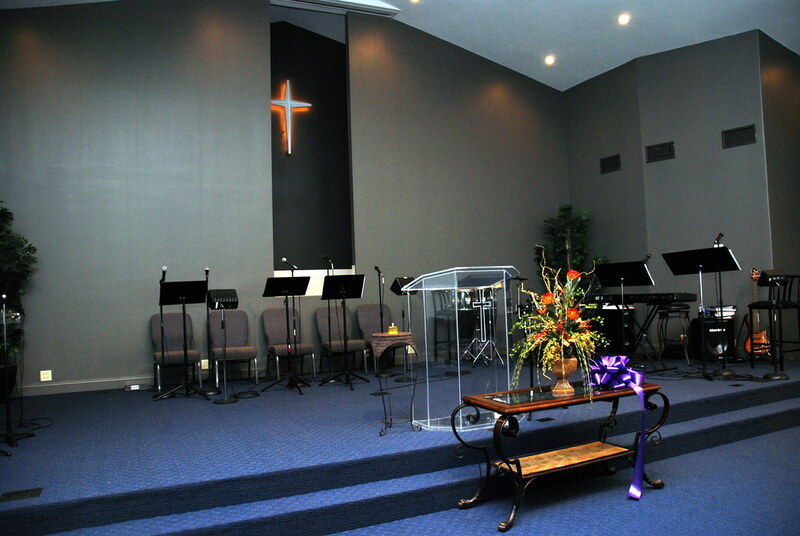 The church has invested resources in all sorts of aspects of the stage. How can I teach my son to honor the space, safety, property, and rights of others if I’m letting him start an anarchist colony near the baptismal? Kids are kids. They need to run, and be crazy. I’m all for that. But it’s my job as a parent to provide him with a structure and the training to operate in that structure, so that he can run and be crazy and still be safe and loving to others. Let’s love our kids. Let’s make church a place our kids want to be. But let’s not do so in a way that is inconsistent with “training up a child in the way they should go”.